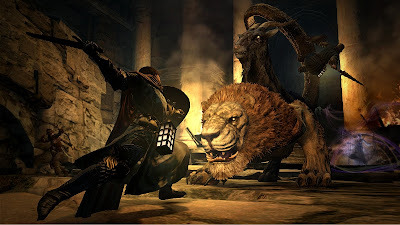 Dragon's Dogma is a highly detailed Action/Adventure title and the demo recently hit PlayStation Network and Xbox Live Marketplace. From what I have gathered about Capcom's new IP is that it has elements of an RPG, because I was traveling with a party of characters and the feel was a mash-up between Castlevania: Lords of Shadow, God of War and Diablo. Artistic style from Lords of Shadow; action/adventure that surrounds massive battle set pieces; Dragon's Dogma also uses a party system where I can grab people (dubbed pawns, at least in the demo) to add to my traveling band of warriors. There is also a basic squad-control system in the game (at least in the demo, it could very well expand in the final release) that allowed me to issue simple commands like “Come” which would bring my pawns to me; “Go” would send them forward and if there were enemies in the area then they would attack whatever was there; there were two other commands, but I believe I've explained enough about the simple commands that everyone should understand that it is basic. Everything plays out in a third-person style were the camera rotates at roughly a 90° angle around the player character. A fun part about the DD is that if I wanted to customize my character, but I didn't. Just stuck with the vanilla main character (referred to Arisen). From what I have seen though is a deep character editor feature. What I liked the most was being able to grab enemies and combo with other characters to kill them. In the demo you will get greeted with this mechanic very early on when the Salde grabs a goblin and tells you to finish them off. The gameplay felt responsive when I started playing, however as more enemies got introduced on screen I noticed the responsiveness drop. Wasn't too dramatic, but was recognizable after the first couple of battles. Plus there were moments where my party members would refuse to follow orders. I would say to attack and they wouldn't move. Even when I was getting attacked by harpies. I found that frustrating as I was being swarmed and realized no one was helping. I ran back to see if the three other people got caught on something just to find that they were just standing there. With the players combat there are two main attack buttons that you can combo other commands to. Square is designated for the light attacks while Triangle is for heavy attacks. By holding down the L1 and R1 buttons I was able to do special abilities according to the equipment I had on. That includes the previously mentioned grabbing which is done by pressing R2. Waiting at the end the of level I played was battle with chimera and I had to grabbing to hold on while it was running around the stage. If I didn't I imagine that battle would have lasted much longer than it did. That was the most fun part of the game though, because it was the first time I had to actually manage my stamina (much like Shadow of the Colossus on the PS2). The less stamina I had to easier it was for the chimera to knock me off. Overall I liked the demo and would be interested in seeing how the final release fares. However, from my experience with Capcom's demo I won't be getting Dragon's Dogma for a long time. Which is a disappointment because I want to support original IP as soon as I can, but this game just its going to be worth the amount that will asked on day one. So once the price has come down and I've gotten caught up on the back catalog of games I currently have to play then I will get it.